Tamo (Riten – my eldest brother) and Iteima (sis-in-law) Remika’s first child was born today at around 1:45 PM Indian Standard Time (4:15 AM US Eastern Time). It’s a baby boy! Weight is 3.5 kgs. Name not yet decided. Other details awaited. The baby boy is the first grandchild of my parents. He is also the first child in our family after a long period of time (25+ years). My monopoly as the last child of the family is finally broken!!! Upgraded my cellphone to a Sony Ericsson T616 camera phone. Took it from Walmart for $25 with a 1year contract. Walmart had the best deal. BestBuy did not have any deals for contract renewals. 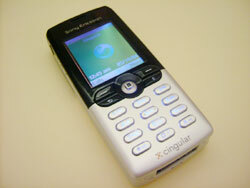 Cingular currently offers the same phone for $150 after $50 mail-in rebate (with 1 year contract). The camera looks really cool and is working great! My dsl connection is down since yesterday afternoon. Am posting this message from Golf Range lab . For the past few days I have been looking for a PHP based POP Mail Reader. Checked out a couple of them. I think that UebiMiau is a really good one. It is really easy to install and does not need any database. Also, it works great both on Unix/Linux and Windows. Really easy to configure. If you are looking for a PHP based IMAP mail reader, use SquirrelMail. It is definitely the best. I would not be searching for other mail readers if Squirrelmail supported POP. There is a workaround to read POP emails using Squirrelmail but you still need an IMAP server to store the data. Watched “Troy” today at Regal West Town Mall at 3:20 pm. The movie was really great! – Monitor used to fail completely while using certain programs like OutlookExpress and PhotoShop. I used to get a blue screen and had to restart the computer. Later I would get the message that there is a problem with the monitor driver. – Green vertical stripes on monitor while watching a video. This problem was usually solved by restarting the computer. – The computer used to become pretty slow. I thought this was strange since I had installed a new hard drive and also reinstalled Windows. Whenever I used to get the above problems, I used to go to Settings > Control Panel > Display > Settings > Advanced > Troubleshoot and decrease the Hardware Acceleration. The monitor used to work properly when I kept it at level 4. (Taking levels as: None,1,2,3,4,5,6,Full). Today, the monitor crashed again while I was using OutlookExpress (the hardware acceleration was at level 3). So, I decided that I had enough and switched the monitors of my Linux and my Windows machines (the Envision EN-775E was originally attached to the Windows machine). So now, my Dell Trinitron UltraScan D1025HTX is attached to my Windows machine. It is working great. The screen is much clearer and better (even though the monitor is couple of years old) and the machine is much faster even with memory intensive applications. So, I guess the previous slowness problem was due to the Envision EN-775E monitor). Bottom line is: The Envision EN-775E looks great but is buggy. Better go for some other monitor if you can avoid it. Watched “Main Hoon Na” yesterday night. Did not feel that the movie was that great. I guess the hype was more or maybe I was expecting too much. IndiaFM gave it a 4.5 stars (out of 5) rating. Rediff also had a special feature about it. Today is Mother’s Day. Called up home at about 8 am IST. Talked with Mama, Baba, Tamo, Iteima. 16 YEARS OF AGE ~ Mother? She’s hopelessly old fashioned. 9/25/2009 – I have graduated from UTK and my personal webspace does not exist anymore. Hence, the links in  below do not work. The script is copy-pasted below for reference, in case you would like to try it out. Previously, I have tried accessing the UTK LDAP server a couple of times. But I always ran into one problem or the other. Finally succeded today. Wrote a PHP script to query the UTK LDAP server. Got the basic info from the php.net website. The script is online here. The source code can be viewed here. Today was the last episode of “Friends”. It was two hours long (8 pm to 10 pm Eastern). Also watched the cast of Friends on Jay Lenno’s The Tonight Show.